Join us in the ancient Panchalingeshwara temple complex (‘Pancha’ is five in Kannada and ‘Linga’ the symbol of Shiva, the Destroyer) in Begur, a historic monument. Learn about the temple and its setting and in the process find out if Bengaluru was really known only from the sixteenth century AD or a whole lot earlier! Learn about ‘Ancient Wisdom as a pathway to modern and sustainable living’ from Dr Jegannathan and watch as he measures energy zones. You might also just end up spending more time exploring the settlement around and uncovering a few more of its secrets. This is a limited participation. Please call 99860 23014 in advance to register for the event. Head south on Hosur Road towards Bommanahalli. 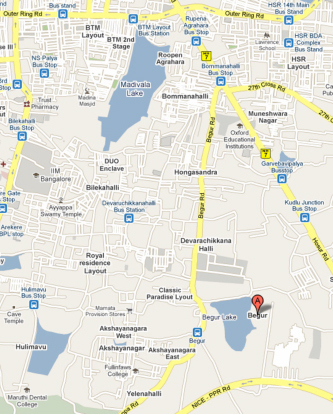 At Bommanahalli junction, turn right onto Begur road. The Panchalingeswara temple is on Begur Road, 3.6 km off Hosur Road. - You can park on the road in front of the temple. - Overall the event will last about 2.5 hours. This event was open only to those who had registered ahead and numbers were restricted (30). The response was good. This was the second collaboration between BCP and INTACH Bangalore. (BCP was the sponsor and INTACH Bangalore provided the content). The event commenced at 8:30am with a brief introduction to INTACH and INTACH Bangalore’s Parichay programme, developed to reacquaint people with the city’s diverse and multicultural heritage, by Pankaj, followed by a note on BCP and its activities by Krupa. Meera then spoke about the temple’s history and handed over to Dr Jegannathan, Professor and Architect, for a talk on energy zones and their impact on the design of Indian temple architecture. He spoke about Agama shastras and gave some in depth information on the series of magnetic grids that encircle the earth and their effects. He conducted a trial in and around the temple with a ‘lecher antenna’ an instrument specially developed to detect these grids. Dr Aruni, Assistant Director, Southern Regional Centre, ICHR (Indian Council of Historical Research), a participant, was persuaded to speak about temple architecture in general and the historical phasing of Begur temple. Meera and Dr Aruni walked the group through the Veergals or ‘Hero Stones’ placed around the temple, most importantly the one dating from about 900 AD, the first written record to mention Bengaluru! The whole group then drove onto the nearby circular mud fort, an intriguing place, more so because its recorded history is currently unknown. The event closed at the fort while some participants drove onto a field nearby to see the statue of a Jain Tirthankar located in the middle. Dr Aruni dated this statue to around 11th century AD. (Interestingly Begur has a strong history of Jain presence). The event went off well with well-researched facts presented by Meera and the fascinating talk by Dr Jegannathan. Participants were pleased to find out that although they had to register for the event they did not have to pay any fee. (BCP, through the Bhavan, sponsored the event).